It sent his manager Jurgen Klopp sprinting onto the pitch to hug goalkeeper Alisson and the fans into raptures, but it was cruel on Everton, who had at times played the more adventurous football in a lively encounter. 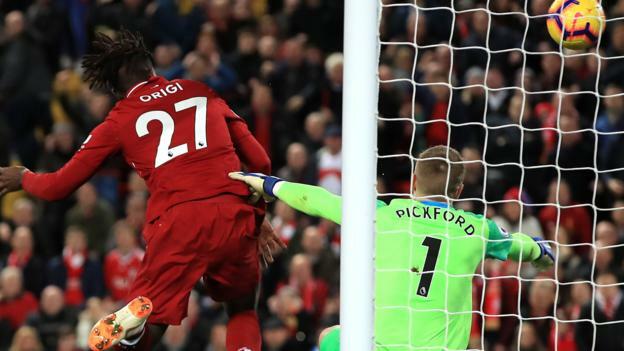 The 232nd meeting between the city rivals looked set to be heading for a draw when Pickford mishandled a high ball that seemed to be heading over his bar and spilled it out to Origi. A late substitute making his first Premier League appearance since August 2017, all the Belgian striker had to do was nod into an empty net to secure a win that consolidates Liverpool’s second place, two points behind defending champions Manchester City.